Passengers traveling to Accra, Brazzaville and Monrovia have expressed disappointment on the cancellation of their flights by the authorities of Royal Air Maroc. The passengers were traveling from various destinations on transit via Casablanca. A number of stranded passengers told the GNA at the Mohammed V International Airport that they were not notified. Information gathered from these passengers indicated that some had been in Morocco for the past two days due to the flight cancellation. On Friday, when passengers got to the Airport and wanted to transit, they were told the flights had been cancelled but no reasons were given. 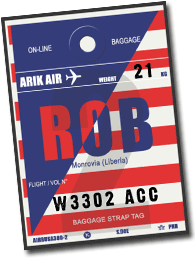 The flight for Accra was fixed at 1000 on Saturday, while the flight for Monrovia was fixed at the same time on Saturday. Mr Francis Fosu, a passenger traveling from Italy told the GNA that the Airline should have notified passengers via text or email. Mr Harold Aryitey, another passenger traveling from Geneva said the situation was disrespectful to the African travellers and said the cancellation of the flights by the Airline was a regular occurrence without explanations.